After her husband traveled to New Orleans in 1850 (he missed Cafe du Monde, 1861), Jane Gilmor Howard (Mrs. B.C. 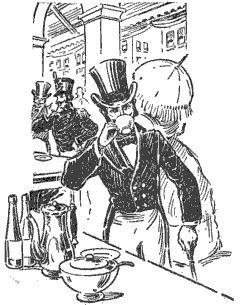 Howard) included a recipe for "beignets souffles" or "Balloon Fritters", deep fried in lard, in her Fifty years in a Maryland Kitchen cookbook, 1873. One light pint of flour. A dessert-spoonful of butter, boiled in the water. Scald the flour with the boiling water and butter, and beat it until cold. Beat the eggs separately, as light as possible, add the yolks to the batter, and just before baking, stir in the whites. Fill a skillet with lard, and when it boils, drop in the batter, a table-spoonful at a time. They will fry in a few moments. To dry them from the lard, place them in a warm oven, on a dry towel, for a short time before serving. To be eaten with wine and sugar. The lard may be used again. Take two quarts of light hop or potato yeast sponge, mix in it a pint of new warm milk, three beaten eggs, a cup of butter or lard, one large cup of sugar, a spoonful of cinnamon, and a little salt; beat this well, and sift in flour to make a soft dough. Set this in a warm place to rise, and when it is light roll it out on the board a little thicker than pie crust, and cut with a knife in squares of about three inches. Let them stand a little and fry them in plenty of boiling lard. If fried in a little lard they will soak the fat, which will spoil them. Throw them, or any other kind of cakes you wish to fry, into a pot half full of boiling lard, and it insures their being light and nicely browned. These fritters are fried in batter made as follows:—Put one glass and a half of water, a grain of salt, and two ounces of butter in a stewpan on the fire, and when it boils, add gradually, with a spatula, as much sifted flour as will make the whole into rather a stiff paste. Let it remain on the fire about three minutes, stirring it continually, and then put it in another stewpan, adding an ounce of fine sugar and as many whole eggs as will be necessary to dilute it to the consistency of common batter, after which it is fit for use. Cut a marrow pudding (or any other you prefer) when it is no more than lukewarm, into oblong pieces of two inches by one and a half in thickness, or any other form you think proper, which you dip in the above-mentioned batter, and then fry them as usual. When your fritters are done, drain and glaze them, and serve quite hot. You may also fry them in common batter. 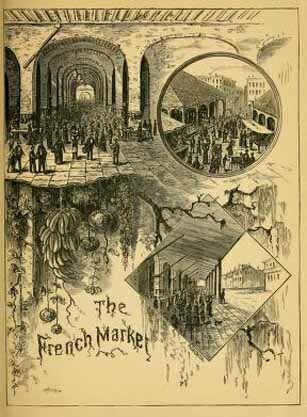 "The French Market is an institution that must be seen to be appreciated. It is conducted on altogether a different plan from the markets in the North. 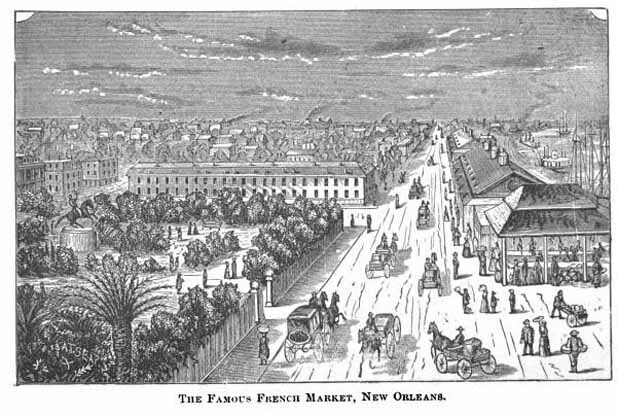 Along the sides of the market-house there are stands erected for the sale of coffee, chocolate, cakes, pies, &c. The market-houses in New Orleans are the boarding-places of hundreds of people who wander about without any fixed place of residence. A cup of coffee is the first thing necessary for every visitor who would see and know what French Market is." "In no place in the world, probably, are the influences and healthful effects of pure coffee more happily displayed than in what is known to every resident and visitor of the Crescent City as the old French market of New Orleans. 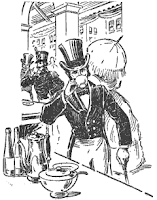 Here, from the "earliest time," have been coffee-venders conveniently distributed throughout the great maze of stalls and marts, and from the small hours in the morning until nearly noon the distributers of this most invigorating of beverages are busy as bees. Aside from their special occupation, these dealers in coffee are a peculiar people. It seems to be an appropriate vocation in this genial climate, which at once strikes the observant traveller when he first sees a French or Spanish mulatto, with her head curiously covered by a gayly striped bandanna, serving hot coffee. Yet it is a fact that it is only people who answer to this description who are the most thorough experts in extracting the delicious taste from the berry, in keeping the delightful aroma from passing away in the rising steam, in providing the best kinds of sugar and the most honest and wellcleaned cups and saucers. The European, the Creole, the New Englander, the men of the West and the far-off Orient, all visit the coffee-stands. While partaking there is for the instant a touch of nature which makes mankind akin, for it is observable that the recipients of the morning cup of pure Java are sociable. Artificial distinctions are discarded in the very act of drinking in the crowded market, or even standing in the open street. 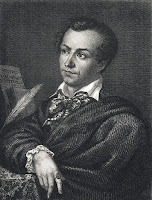 But it is the very thing, this mixture of the rude and the refine, that adds zest to the "open-air cup of coffee." The merry twinkle of the eye of the attendant quadroon, her quiet manners, her attentive observance of the wants and tastes of the various customers, the very polish of the tall copper kettle, the jet of steam, the whiteness of the crockery, constitute associations that, once realized, one never forgets, and justly places coffee among the most grateful, innocent, and healthful things that we Americans include among the necessaries of life." "What a resort it is! I feel a sympathy for the unfortunate who has not visited the French market at dawn, mingled with that indescribable throng, listened to the queerest of languages from the tongues of the queerest of people, and finished the visit with drinking a cup of the nectar which is served, under the name of coffee, at the ridiculously inadequate price of five cents per cup."